The intersection of Interstate 35 East and Bear Creek Road in Glenn Heights. GLENN HEIGHTS—The Texas Department of Transportation (TxDOT), in conjunction with the City of Glenn Heights is proposing improvements to I-35E at Bear Creek Road from Hampton Road to I-35E in Dallas County, Texas. A public hearing on the proposed project will be held Tuesday, March 26, 2019, at the DeSoto ISD Belt Line Conference Center, 200 East Belt Line Road, DeSoto, Texas, 75115. Displays will be available for viewing at 6 p.m., with the formal hearing starting at 7 p.m. The purpose of the hearing is to present the planned improvements and to receive public comment on the proposed project. 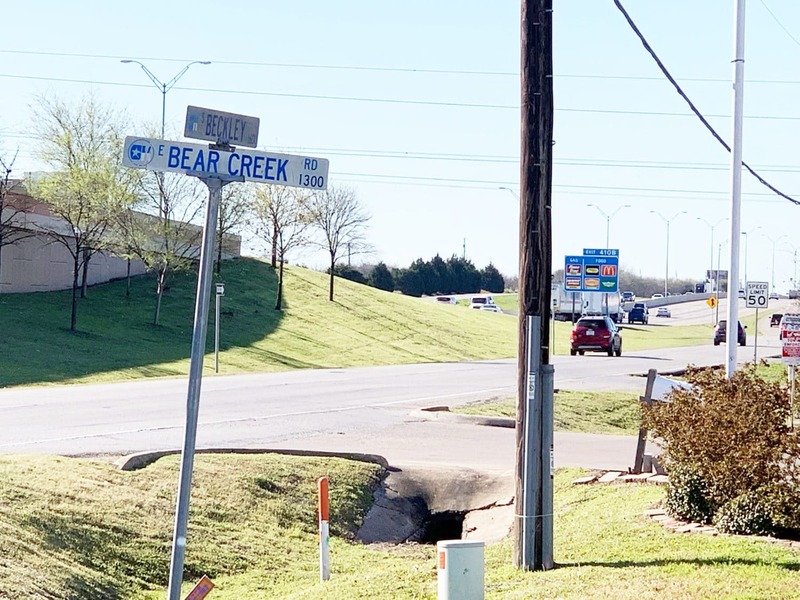 The I-35E at Bear Creek Road proposed improvements would consist of the reconstruction and widening of Bear Creek Road from Hampton Road to I-35E within the cities of Glenn Heights and Lancaster in Dallas County, Texas, a distance of approximately two miles. Bear Creek Road is an undivided, two-lane rural highway within an existing right-of-way of approximately 80 feet. Proposed improvements would include two travel lanes in each direction with raised median and curb and gutter; continuous sidewalks; and a 12-foot shared-use path within a proposed right-of-way width of approximately 112 feet. Additional improvements would include reconstruction of the I-35E/Bear Creek Road intersection and the replacement of the I-35E frontage road bridges. The $36.5 million project is scheduled to begin in 2022 with an estimated completion date of 2024. The westbound I-20 entrance ramp from Carrier Parkway will be closed overnight Friday, March 22, beginning at 7 p.m. The ramp is scheduled to re-open at 6 a.m. Saturday, March 23 weather permitting. Motorists on Carrier Parkway and the westbound frontage road of I-20 will be detoured south onto Carrier Parkway to Westchester Road, then west on Westchester and right on Robinson Road to return to the westbound I-20 frontage road. From there motorists may enter westbound I-20 from the next entrance ramp. All northbound lanes of Interstate 35E (I-35E) will be closed overnight in Waxahachie on Wednesday, March 27 and Thursday, March 28 from 9 p.m. to 6 a.m. each night for the implementation of a traffic switch. During both nights of the overnight closures, motorists will detoured at Exit 404 (Lofland Road) and remain on the northbound frontage road, and re-enter the I-35E northbound mainlanes at the next entrance ramp. Expect delays.